Bengali's No. 1 Reality Show. Mirakkel Akkel Challenger Season 10 audition date and time will be informed soon on. New! Most of this videos are country restricted. These videos are visible in India. If you live in Abroad then download YouTube Unblocker addon (it is less than 200 KBytes) for Mozilla Firefox / Chrome / Opera or Apple Safari and watch Mirakkel Akkel Challenger with us. New! 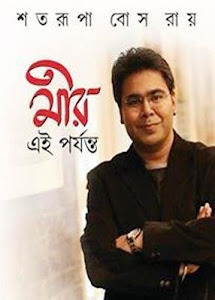 Sristisukh publisher is going to publish a book on Mir's (Mir Afsar Ali) life "Mir Ei Porjanto". 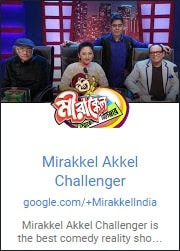 Mirakkel Akkel Challenger is an Indian Reality Show broadcast on Zee Bangla TV channel offers a platform for stand-up comedians across Bengal (both India and Bangladesh) to showcase their talent. This show hosted by Mir Afsar Ali, directed by Subhankar Chattopadhyay and judged by well known television actors and actresses Paran Bandyopadhyay, Sreelekha Mitra and Rajatava Dutta. The members of Mirakkel band Bandage are Saurav Bhattacharya (on Vocals & Lead Guitar), Suman Sinha (on Keyboards), Nitin Mani (on Bass Guitar), Koushik (on Dhol & Percussions), Subhajit Sarkar Chiku (on Tabla) and Dwaipayan Saha (on Drums). 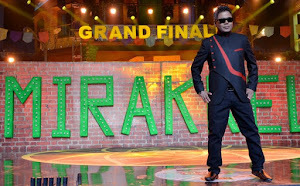 To know more about this show, visit Mirakkel Wikipedia page.